Folks, I don’t ask much of my neighbours; basically keep the noise to a minimum and return my newspaper before I start breakfast. But this week, the pre-dawn peace was shattered by a mob who had moved in at the end of our street and immediately decided to hold an hour long yelling match which woke several households. The din had stopped by the time I lurched out the front door to go to work, but only because they were digging through my rubbish bin. “Stone the crows!” I bellowed, for that’s exactly what they were; crows. “Goodness me!” I exclaimed, while dashing about picking up garbage, “What a blessing you squawking twits will be to our neighbourhood!” Actually, what I’d really yelled was drowned out by their raucous croaking and the sound of windows slamming shut up and down the street. That afternoon, I returned home to find they had broken my TV aerial and while I was fetching the ladder, one of them pooed all over my cars’ windscreen. “That’s it!” I shrieked and raced back inside, re-emerging minutes later with my pockets stuffed with golf balls. “That’s against the law!” announced a woman who’d been watching the show. So, the only hope of peace returning to our neighbourhood anytime soon is if the nesting tree somehow falls over, or the noisy sods shift to a more exclusive address, like the dump. 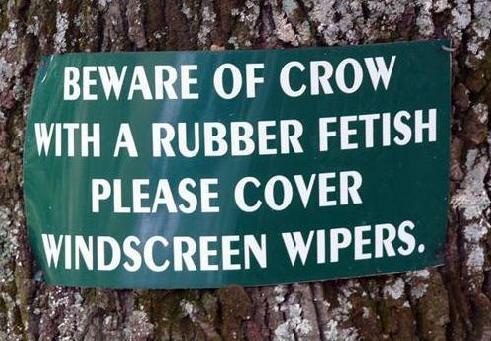 Either way, it will definitely give me something to crow about. This entry was posted in On a Lighter Note... and tagged Crows, Neighbours. Bookmark the permalink.